Here’s a scene that plays out in the boatyard from time to time. A work order calls for rebedding a leaking porthole. 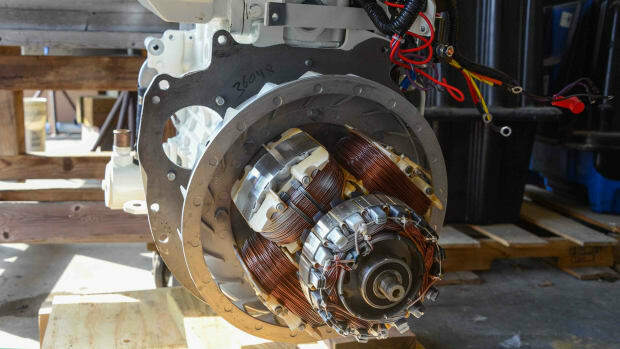 After all the fasteners are removed, the hardware remains firmly in place. Some coaxing with a putty knife and some heat fails to free the porthole from the surface. At this point we can identify our foe. It’s a familiar antagonist known commonly by a number: 5200 (officially it is 3M™ 5200 Marine Adhesive Sealant). Out come wedges and hammers and solvents and curses and grunts. After an hour or two of struggle, the porthole finally lets go of the cabin side, but not without breaking off chunks of gelcoat and fiberglass. This unfortunate scenario begs this question: If the porthole is held in place with stout stainless steel machine screws, why does it need an adhesive to hold it in place? 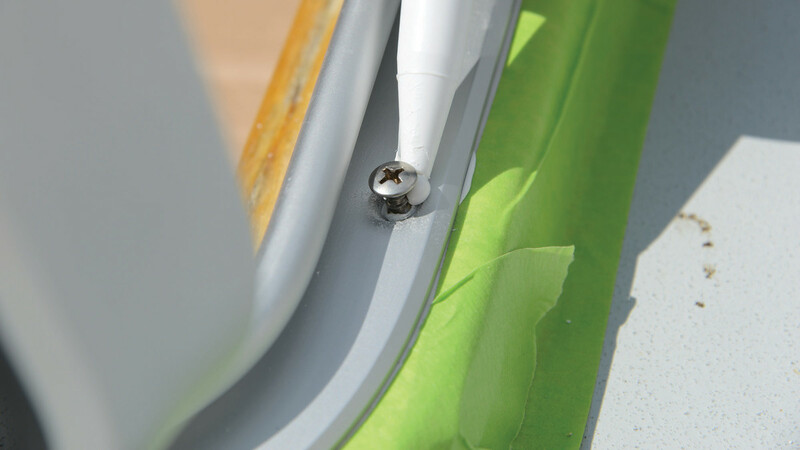 A bead of sealant should be placed under the head of each fastener. First you must understand what you are trying to do. If you are trying to hold a fitting in place, you need an adhesive. The hull-to-deck joint would be one example; a fiberglass-mounted pad attached to a cabin top would be another. And if you want to hold it in place and keep water out, you need an adhesive sealant. If you are trying to keep water out of a seam or a joint, you need a caulk. Caulking takes place after the item has been installed. 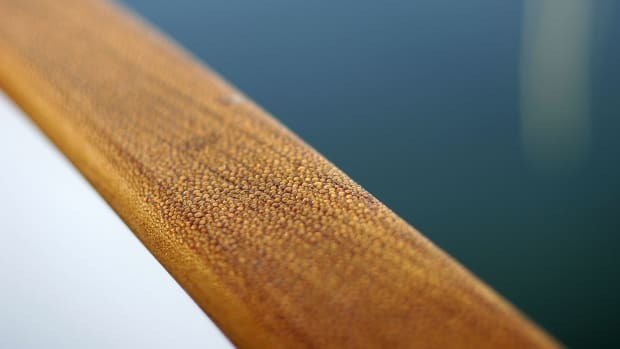 Filling the seams between teak planks on a deck calls for caulking, as does covering a joint between a cabin top and a cabin side with a bead smoothed over the seam. Once the fastener is tightened excess sealant can be removed. If you are trying to keep a fitting from leaking and/or to keep water from standing between the fitting and the mounting surface, you need a sealant. Examples include a ladder base mounted on the cockpit sole or a porthole mounted on a cabin side. 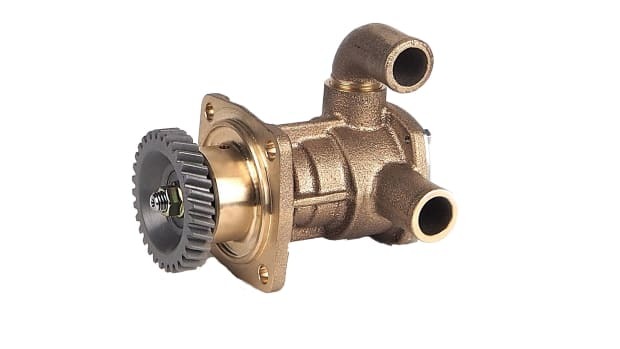 Finally, you must consider whether the installation will be above or below the waterline. Each product type strikes a balance between strength, flexibility, and resistance to chemicals and UV rays. Adhesives maximize strength. If you intend to never separate the parts, a high-strength adhesive can be appropriate. We have lifted sailboats, removed all the keel bolts, and looked on as 12,000 pounds of lead held fast to the boat because of the adhesive. In other words, use a high-strength adhesive when you consider the bond to be permanent. Sealants typically provide greater elongation than adhesives and lower strength. An ideal sealant will expand and contract with changes in temperatures and movement of the parts. A stainless rub strake will expand at a different rate from the wooden or fiberglass rub rail beneath it. If the expansion rates exceed the elasticity of the sealant, the material will break down and water penetration will soon follow. Caulking compounds have moderate adhesion, good elasticity, and high chemical and UV resistance. 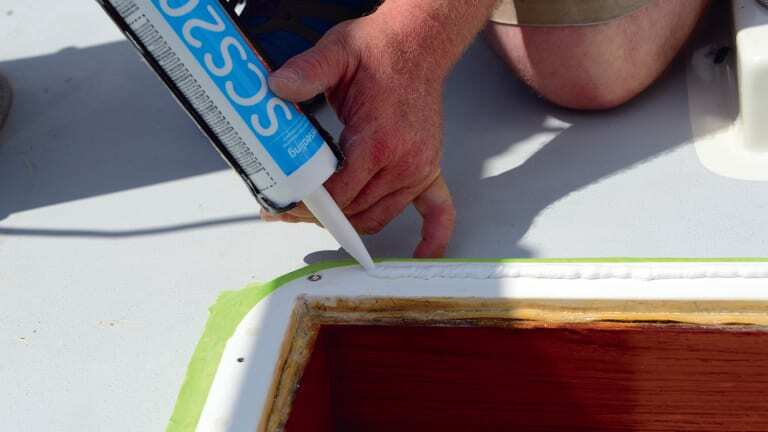 Unlike sealants and adhesives, caulked seams remain exposed to the elements as well as other issues such as boat cleaners and UV rays. 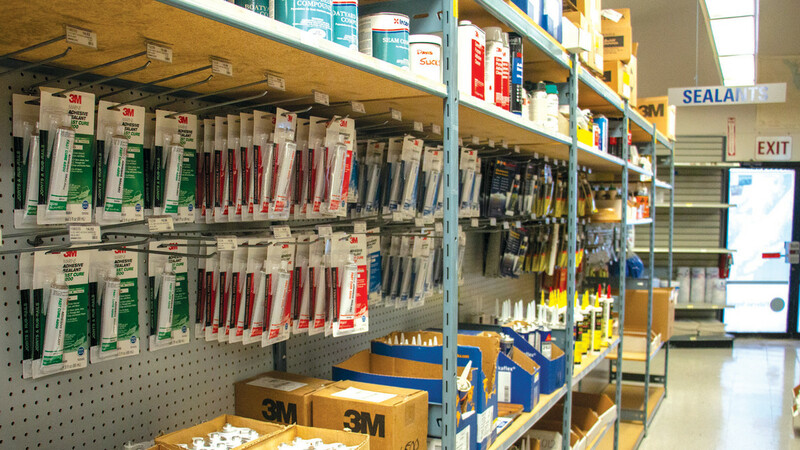 The array of sealant choices at Fisheries Supply in Seattle. Your local marine supply store will offer a bewildering array of choices. It pays to understand the differences and how they relate to your situation. Sold in a roll with removable film on one side, butyl has the lowest strength and highest elongation. Some cruisers swear by it—butyl is easy to apply, requires minimal cleanup, and provides great elasticity. On the other hand, butyl remains sticky and attracts dirt. And although you can avoid the squeeze-out and cleanup routine of the other sealants, the edges of the butyl must be trimmed and can often look a little uneven. Providing high elasticity over long periods and through a wide range of temperature variations, silicone has a strong resistance to chemicals, is UV resistant, and is easy to apply. It cannot be painted, however, and when cleaning up you can contaminate the surrounding area (which can complicate painting or varnishing). Silicones come in two varieties: neutral cure and acid cure. Acid cure is easily identified by its strong vinegar-like odor, while neutral cure has almost no smell. Neutral cure is preferred as it adheres more reliably. 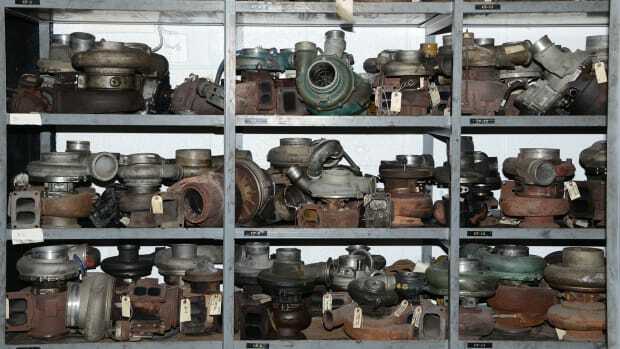 We have had good results for many years in our boatyards with GE SCS2000 SilPruf, and an abundance of other good choices can be found on the chandlery shelves. For many years polysulfides were the go-to material for sealants. Polysulfides maintain their bond well and have very good chemical resistance, which I can attest to having tested its limits as a young summer hand on a boat with a teak deck. The owner insisted on freshly bleached decks with a beautiful gold hue. We kept pushing the envelope with the deck bleach until one day I saw him stand up after sitting on the deck and noticed black stripes on his white pants from the seam compound. All products have their limits. Polysulfides cure slowly and should not be used with Plexiglas, Lexan, and many other plastics. BoatLIFE Life-Calk has been around for many years and has proven itself in a wide variety of applications. These polyether products are relative newcomers. They are very effective for caulking beads as they are non-yellowing white compounds with high UV and chemical resistance and can be painted. Polyether is fairly tenacious and should be thought of as more of an adhesive. It works well with some plastics, and 3M 4000UV is a good example. Also more adhesive than sealant, polyurethanes do not resist chemicals as well as silicone dones and cannot be used with most plastics. The previously mentioned 3M 5200 provides the most permanent version of these products. 3M 4200 offers a more moderate adhesion strength, while Sikaflex-291 works well for low-strength applications. As with all things boating, folks will argue for their proven material or method. Before we get into some application details, I’d like to address two of my pet peeves on this subject. The first comes down to sealant versus adhesive. If the hardware you are bedding will be held in place with substantial metal fasteners, then you should not be using anything more than a low-adhesion product. Eventually you will want to rebed that item and removal should not include destroying the fiberglass. Some will argue for applying sealant to the fasteners and leaving the hardware itself dry. Picture that stainless rub strake mentioned earlier—bedding the entire length will require more time, more sealant, and a lot of cleanup. As the argument goes, leaving the back without sealant will allow any water that gets in to drain out. I’m not a fan of that approach. The continual exposure to salt water often leads to staining and discoloration of the metal, which then bleeds onto the surrounding area. I prefer to see metal attached to fiberglass with a healthy film of sealant between the two. The sealant should be applied liberally so that you see “squeeze out” of excess material around the entire perimeter. Two-inch-wide tape helps keep the excess compound from making a mess. 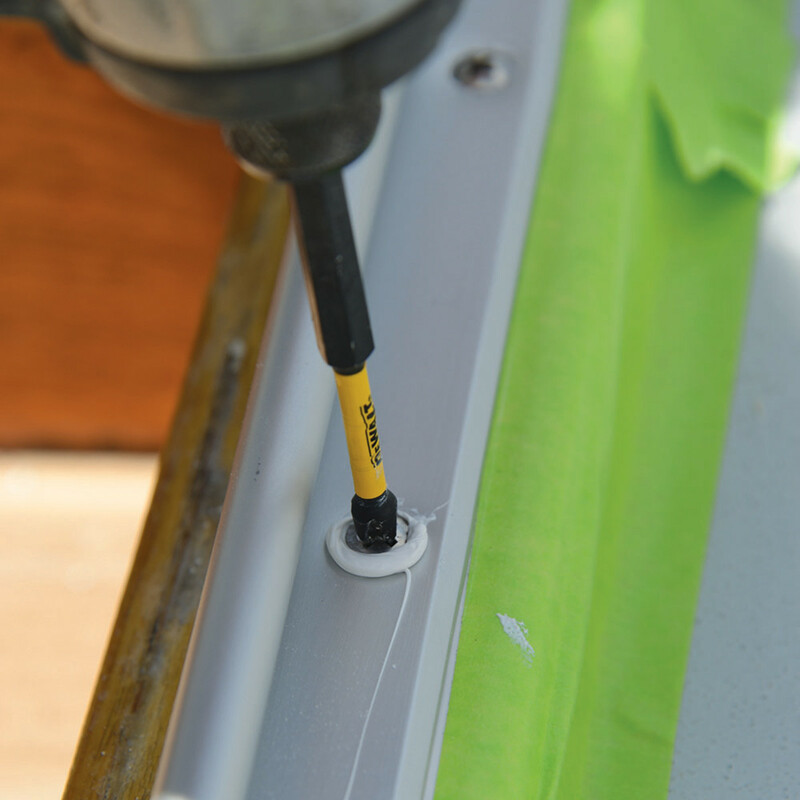 While we have just noted that adhesives, caulks, and sealants all serve different functions, for sake of simplicity we will use the term “sealant” to refer to all three types when discussing their application as they require similar considerations. If the surfaces are glossy, scuff them up with some sandpaper to promote adhesion. Both surfaces should be cleaned before applying the sealant. Wiping with denatured alcohol works well. Dry-fit the installation and then mask around the perimeter with 2-inch tape. Apply the sealant liberally to one of the mating surfaces. 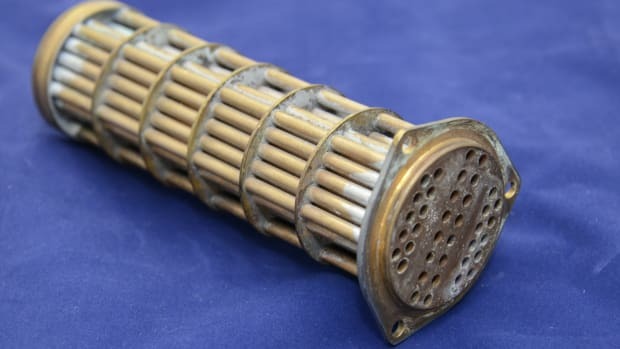 In addition, make sure you get some sealant on the underside of the fastener head and on the portion of the shank that passes into the hardware and the structure. Now tighten it all up and allow the excess material to squeeze out onto the tape. Sealant should squeeze all the way around the perimeter—that’s your assurance that the entire surface has been coated. If you are using slotted head fasteners and you want them lined up, now is the time. Once you have finished tightening the hardware, it’s cleanup time. Solvent matters and you must pay attention to the label information. Some products will specify mineral spirits; others will call for alcohol. Choosing the wrong solvent for cleanup can ruin the sealant. Some products can be purchased in a fast cure or slow cure version. If you are working in the heat of summer and installing a more complicated component, such as a windlass, the slow cure will give you more working time. All sealants have a lifespan, but that span depends on the product, the application, and the amount of exposure to UV, chemicals, and abrasion. 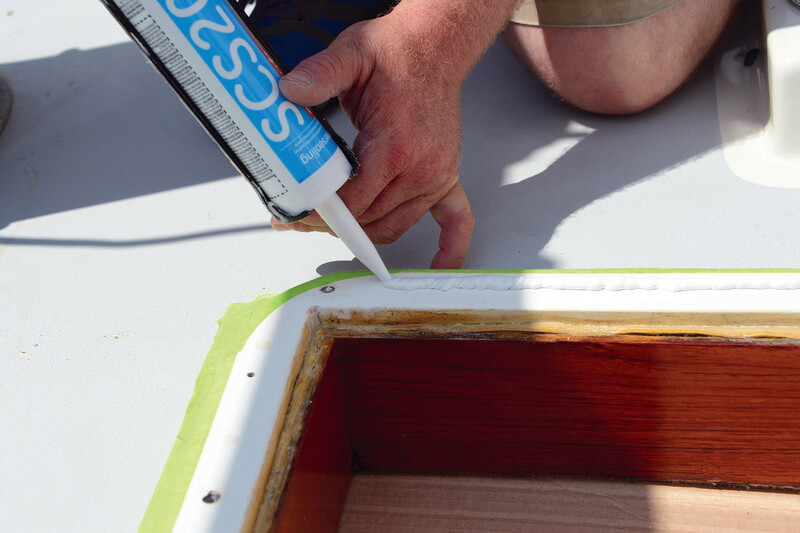 The sealant under a seacock, for example, will last two or three times as long as the seam compound in a teak deck. Ten years would be a rough guess for deck hardware, but how do you know it’s time? Leaks provide an obvious indicator, but not all leaks can be detected as they often leak into the core. 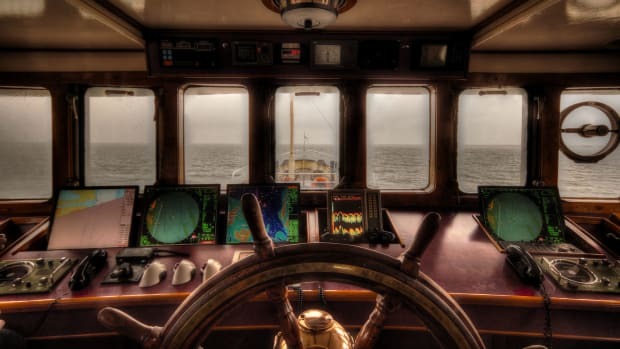 Checking the deck and cabin with a moisture meter every few years can save you tens of thousands of dollars by preventing ongoing hidden leaks from saturating the core material. 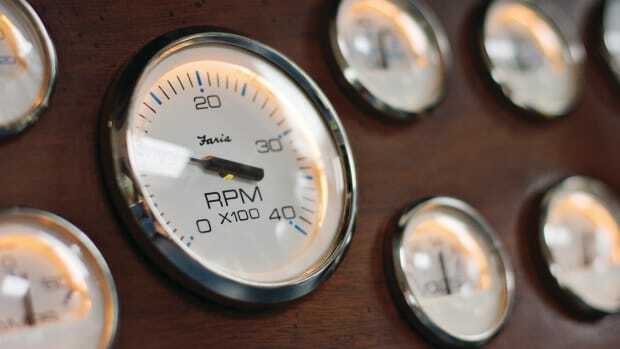 If the meter indicates elevated readings around a porthole or ladder mounts, it is time to rebed. If one item needs rebedding, it probably indicates a general need to deal with all of the hardware. Visual inspection can be helpful, too. When the sealant shows cracks and roughness it should be renewed. When you have identified a general need to rebed hardware, you might consider a gradual approach over a few years. You could deal with the foredeck and side decks this season, the cockpit the next, and the flybridge two years from now. 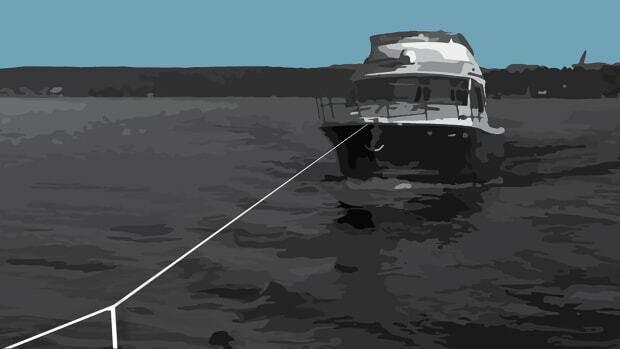 If you are buying an older boat (pre-2000 for example), you should plan on rebedding gradually during the early years of ownership. Whether installing new hardware or rebedding old, choose the sealant thoughtfully and clean the surfaces diligently. 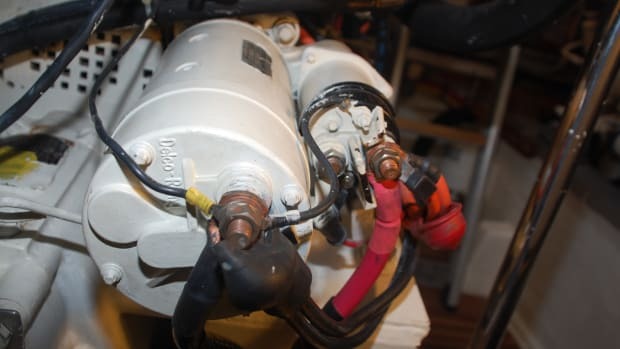 It might be a mundane task, but it will protect your boat’s structure and will eliminate annoying—and potentially costly—leaks.